I just went through exactly the same thought process. The kind folks on this forum nudged me away from the WI64 and toward the WI66Pro. You're right - folks seem to LOVE the 66Pro. Of course, that's more money. Funky Munky, a very knowledgeable dealer on this forum, suggested that I look at the WI45. Funky Munky said the WI45 is the same guitar as the WI66 but with Randall (Egnater) pickups instead of the Seymour Duncans that are on the 66. Funky Munky called the WI45 the sleeper of the Idol line. I went for the WI45, got it from Funky Munky for a great price and, so far, am very happy with the guitar. You can see my reviews on here. Flamed transparent red - gorgeous to look at. I've had it now for a couple of months and, if anything, the more I play it the more I like it. I like the stock Randall pickups but I will point out that, for the price difference between the WI45 and the WI66, you could swap Seymour Duncans into the WI45 and still be at the price you would have paid for the 66Pro. You should consider having a chat about the choices with Jon at Funky Munky. By the way, noting that you are from Oman, Funky Munky did a very good job with international shipping - no hassles and it cost me a grand total of CDN$15 to get this guitar into Canada from the USA. short snapper . . . I'll have to get to your other questions later but, for now, Jon is Funky Munky on this forum so you should be able to PM him from here. OK . . . got some time now. I don't mean necessarily to push you to the WI45. That is, if I was willing to spend the dollars, I probably would have gone for the WI66Pro: all those great reviews must be worth something. However, if budget is a concern (i.e. how the heck am I going to justify this to the wife?) then I think the WI45 is a very good alternative, especially if you are going to get dinged big time for shipping. In my view, the WI45 does what Washburn seems to do best: it delivers great value for the dollar. I feel the same way about my fairly new D10SCE. You just seem to get better, more playable guitars at the mid to lower end price points from Washburn. As I have said, I'm very happy with my new Idol and that remains true a couple of months in. It's growing on me = good. It is, indeed, a lovely thing to look at (I'm still doing that a lot). The flamed trans-red is the right finish for this guitar. I would say that the Randall pickups are really designed to go in the pocket in a power pop punk style (think Green Day, Taking Back Sunday, etc.) but it does pretty darn well in sweet and clean mode as well. You can certainly do blues and classic rock with it. She's a LOT of fun to rock out on! This guitar has very well done jumbo frets and likes a light touch. Generally, the appointments/quality are extremely good for a guitar in this price range. You will have seen in the review that I said that this guitar makes me aware of some of the limitations of my Vox AD30VT which, really, is designed to be a practice amp. When I pipe this guitar through the Vox via my Behringer 1202FX mixer into headphones, I just LOVE the tones and clarity I get. Played through the amp's single 10 stock speaker, I find I lose some sound quality (warmth and clarity). So, you guessed it, I'm starting to dream about amping up to something a little more capable. I love the versatility of the Vox modelling amps so I would consider, perhaps, moving up to the AD100VT (2 x 12 Celestion, I believe). As expected, Vox does its own tones best and I find the Boutique Clean and Vox AC30 settings on this amp to be the most rewarding places to play. Every now and then a bit of serious hi-gain metal distortion is a most pleasant diversion but it's probably not what this amp does best. The AD30VT is GREAT for its combination of power with portability - I got one for my daughter because it's so easy to carry. The other great feature of the Vox Valvetronix series is the master Level Out control. You can maintain whatever tone you have dialled in and control just the volume - great for late-night practising. Other than the speaker, which is OK but not splendid, the knock on these amps is the 1/4 instrument-in jack. As the reviewers say, it can quite easily be dislodged and, as it is top-mounted, can fall into the cabinet. That is pretty well taken care of if you use an L connector on the guitar cable but it's still something worth knowing. I don't have any video or sound clips and it's probably a little beyond me to make something of good enough quality to give you a true sense of the guitar. I noted in my review that there is very little good information out there on the WI45. 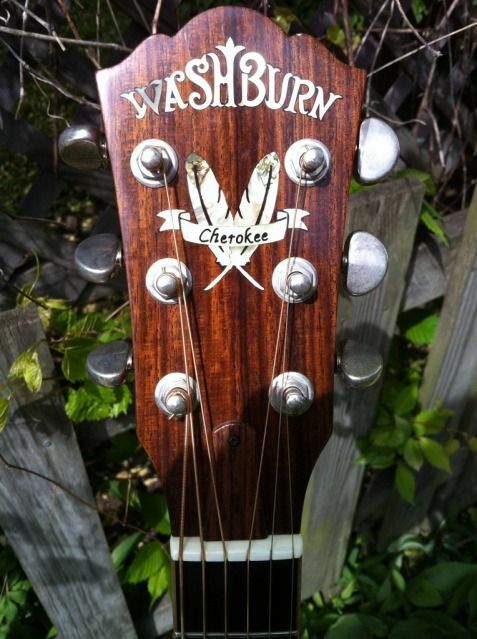 Washburn - a high quality video demo on the Internet would be very useful indeed. I can say that the humbucker settings on the VCC controls do give you a very good humbucker sound. Mostly, I find myself playing on the single coil settings so far but that's just my personal preference. Speaking of VCC, that is one area to consider, whether you go for the WI64, the WI45 or the WI66Pro. The volume and tone dials do take some getting used to. As I said in my review, I like 'em fine and I like the fact that I can get a very wide range of tones with them. However, the volume controls do seem to have a substantive impact on tone. That's fine for me doing basement rock - I just adjust volume at the amp. I could see it being a real issue for a gigging musician though - can't be running to the amp to do volume changes and, if you want to preserve a set tone you have dialled in on the guitar, you might need to adjust volume externally. Finally, be aware that the WI45 comes with a soft-shell gig bag, not a hard-shell case. It seems to be difficult to get cases for the Idols on the open market so, if you need one, best to get that done as part of the original purchase. I can see where you might need a hard-shell - something to talk about with Funky Munky. 2) Set to a reasonably clean amp model (say Black 4x12) and with two pickups going, both set to full single coil, you can get a nice clean clear tone. Good for, for example, Snow. I think with the Vox modeling amp, I could get pretty close to the tones required, be it clean arpeggios or some more distorted Under The Bridge type stuff. 3) This guitar asks to be played with light hands - good for what Fruscianti does. Oh yeah . . . Sorry, I don't know the price for hardshell case. I just went with the included gig bag. I don't transport this a lot. So, this is a done deal? guitar on it's way? That's gotta be a great feeling. Looking forward to hearing what you think! Make sure you get it insured for shipping. Shouldn't add much, if anything, to the price. beyond that, Jon is probably among the knowledgeable guys you'll find as a resource, given he's responsible for hundreds of guitars and cases every day, including many non washburn brands....I'm thinking that if that is his preferred case, there's good reason. Either way, I think a hard case is a good idea, given how far this thing is going to travel, and the fact that a case is that much harder for you to come by after the fact.